This is a fun little Xbox/PC/soon iOS game in the old Dragon Warrior style. It’s cheap ($1-3, depending on platform), well made, and doesn’t overstay its welcome. The developer is also making the upcoming Penny Arcade sequel, which looks great! There are some other reviews of the game out there, so I want to focus on some particular game mechanics that I liked. Cthulu Saves the World looks to keep the gameplay similar to older games, so improvements to the game must come from improvements to these gameplay loops. While in a dungeon, your main resource is health and mana. Health drops fast and is refilled by mana and potions. Mana is a longer-term resource: once you run out of mana, it’s about time to head back to town. Cthulu tweaks a key piece of this loop. After each fight, the party is completely healed and a small amount of mana is restored. It saves trips to the menu after every battle. You spend more time fighting and exploring. The change goes deeper than that, though. 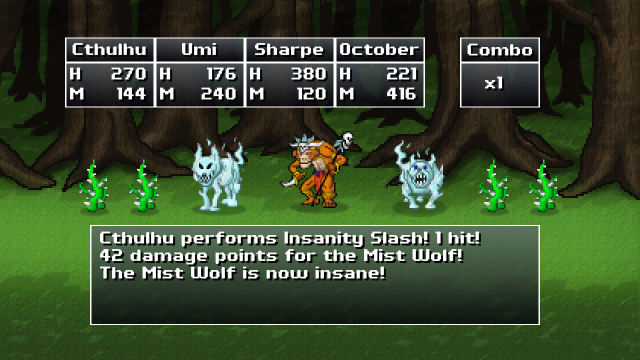 Monsters in Cthulu are fiercer than normal, strong enough to take out party members faster than you’d expect. Each round, monsters get 10% stronger. So round 2 is 110% and round 10 is 190%. Long battles get tense as monsters bash your party as fast as you can heal up. You need to play smart because battles can’t go on and on. In other RPGs, individual battles need to be easier to avoid depleting the party too quickly. The average battle is somewhat easy, even dull. If you are strong enough, strategy is unnecessary. 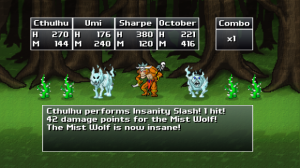 Cthulu subverts this lull by making individual battles more interesting and challenging. Like the healing change, this helps the whole loop be more fun. There are many modern ways to make level progression fun. Diablo 3, Mass Effect, and Witcher 2 all have great ideas. They aren’t very retro, though. They’re quite menu heavy and complicated, which is a poor fit for the 16-bit aesthetic. Cthulu has a simpler approach. You can shape your characters. Take a lot of Strength to make your basic attack stronger. Improve durability and survive longer in dungeons. Chose to improve your single target spells, or your slowing spells, or your spells that spread damage across the whole enemy group. Each character can be specialized for a particular role or you can spread abilities across multiple characters. This is great. You chose between making all of your spells by a small amount or one specific spell by a TON. You don’t need 20 strong spells; each character only needs maybe 5 to 10. So you craft your characters to have the specific spells you want. You’ll have to let some of the specific upgrades pass so you can take the basic upgrades you’ll need to keep up. The system is simple (a quick choice every 10 battles) but gives satisfying customization (many different possible builds). It feels like a feature that could be in an old RPG, but it’s a bit more clever than what you’d see in those games. As I mentioned in the introduction, Cthulu Saves the World is a good value and isn’t too long. I recommend it!